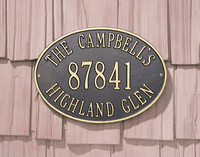 These beautiful plaques are crafted from rust-free recycled aluminum. Paints have been specially formulated and weather tested to withstand the harshest elements. Many of the plaques are designed to provide maximum visibility to meet local 911 emergency standards. For anyone who loves a garden! Simply stated for small spaces!